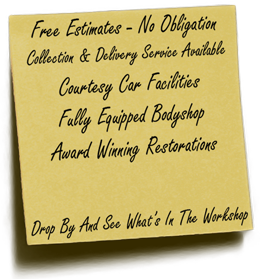 Here at Roberts Motor Bodies our craftsmen can carry out anything from the smallest scratch, dent or scuff to a major restoration project or re-spray to the highest standard. Our Commitment to quality is second to none and this is why we have a loyal customer base who return to us for specialised work on their vehicles and motorbikes, both private customers and our commercial contracts. With full bodyshop facilities, our own vehicle transport equipment, enthusiastic staff and an extensive range of contacts we can provide a complete service for getting you back on the road promptly, safely and above all happy. For more information please contact Bryan or Gemma Whitfield, our friendly team who will be pleased to offer you a competitive quote. In the mean time, please have a browse through our Gallery to see previous completed work including some award winning restorations and paintwork.